Vada's Blog Stamp Inks and Paper : GC #112 Color Challenge. Leather, Iron and Brass are the colors for this challenge at Gingersnaps. 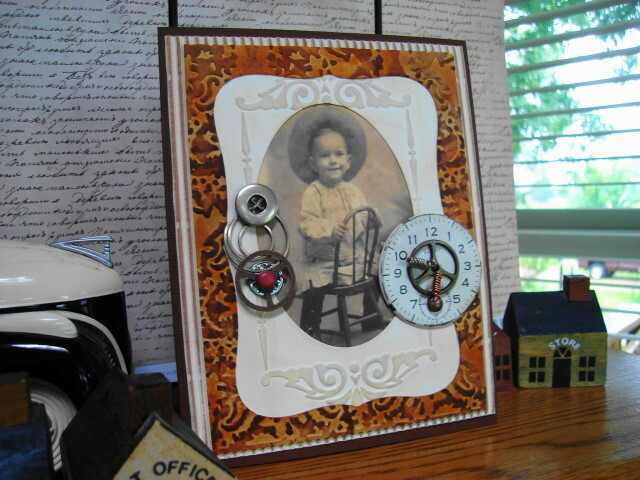 My graphic is from “Magic Moonlight”, and the embossing folders are from Spellbinders. Great card Vada! Those colours look great and love the image! Adorable, Vada! The image looks wonderful with that lovely background! I have info about a free collage sheet on my blog. Hugs! How darling Vada! Love it!!! In 100% agreement with Lynn, I love this! I like the cards you make.